This cassette came with little band info though I suspect it's a solo project. The music is all-electronic and most of the six tracks include a dark vocal style. "Genesis" is an interesting instrumental that starts with a dual combo of drone and higher pitched siren against a steady electronic drum beat. The synth sounds change again and though there's nothing unusual about the sounds themselves, Seventh Sign bring their various tones together in pleasing combinations. The melodies are simple but trip along nicely. "Red Horse, White Horse, Black Horse, Pale Horse" has freakier bubbling and pulsating synths. The vocals on this tune have a dark, ethereal, maybe even gothic feel. A simple tune but there's a surprising amount of layered complexity to the electronics that make up the music. In one sense this could be called a pop tune, but it's backed by well thought out and mixed music. "Seventh Sign" is a similar track, but is a pretty catchy tune and I liked the drugged pace that, again, makes use of the instruments beyond just simply laying down an electronic beat or melody line. "Television Skies" is a vocal tune sung against an eerie pulsating background with a cool higher pitched warbling synth melody. "New Millennium" is more electro-pop than the other tunes, but still retains a dark freaky element that keeps things interesting. Overall this is a low-fi set that is a bit raw, but Seventh Sign offer creatively constructed songs that focus on the music as much as the song. I'd like to hear more from them. 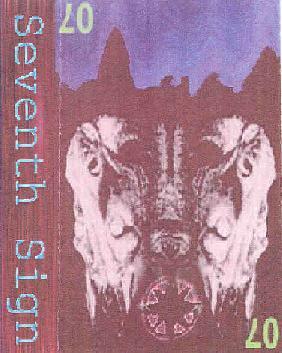 For more information you can visit Seventh Sign at their web site. Via snail mail at Tape Hiss, 260 N. Keswick Ave #C, Glenside, PA 19038.